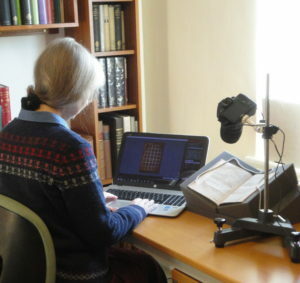 The Oxford Traherne has developed a new digital collator. For free download of the Traherne Digital Collator software and detailed specifications of its camera equipment, see the links below. 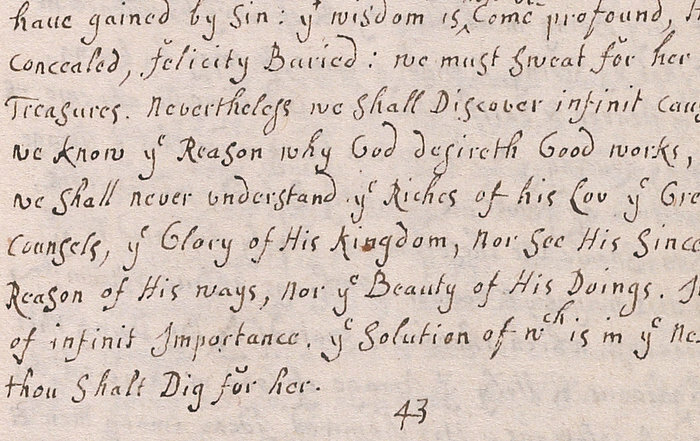 Collation is the process of comparing different copies of the same text in order to identify variants between them, and is a crucial part of scholarly editing, both for establishing an accurate text and for understanding the history of the printing process. This has often been done using an optical collator, typically consisting of a pair of plane mirrors which can be manually adjusted so that images of two different copies are quasi-superimposed by the brain, allowing differences between them to stand out. While this method has achieved good results, it is both time-consuming and tiring to the user. The Oxford Traherne, in collaboration with Professor Andrew Zisserman FRS, Joon Son Chung, and Dr Abhishek Dutta (Visual Geometry Group, Engineering Science, Oxford), and Dr Christopher Palmer (Balliol, Oxford), has developed the Traherne Digital Collator, an innovative digital collation system, which is easier to use than existing methods of optical collation, will enable faster and more detailed textual comparison, and make it possible to analyse the printed text in ways not currently possible. We anticipate that it will transform the scholarly editing process, and become a standard research tool. 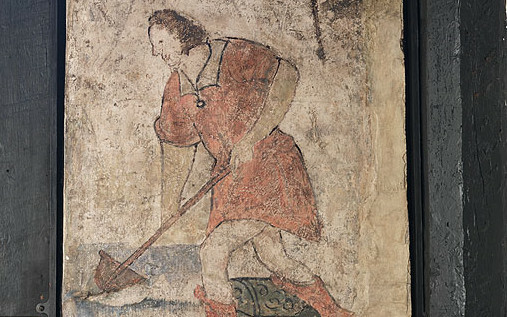 We believe that collation should not be divorced from examination of the material text, and that there will always be features which can only be interpreted by the examination of the original volume. We have therefore designed a system which combines digital functionality with the retention of the vital link to the physical text. It consists of image comparison software and associated image capture equipment, in a portable form suitable for use in libraries. Live images of the physical volume are displayed by the camera on a laptop, while the software compares them with existing photographs of a second copy of the text and automatically identifies variants. The software performs transformations to align the images, and can offer a choice of several different visualizations of the variants. It can also be used independently with two image sets. 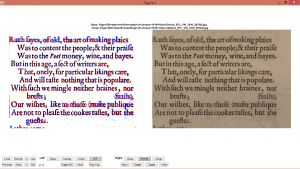 The Traherne Digital Collator has been through several stages of trial and refinement, and is now freely available to colleagues from other scholarly editing projects. The collator is still under development, and this wider network of scholars now contribute to its further refinement with their feedback. We are currently working on a new version of the collator which will incorporate an improved user interface, and some of our users’ suggestions for additional features. We expect to release this in the Spring of 2019. If you use our collator, we encourage you to send your comments to the general editor, Dr Julia Smith. 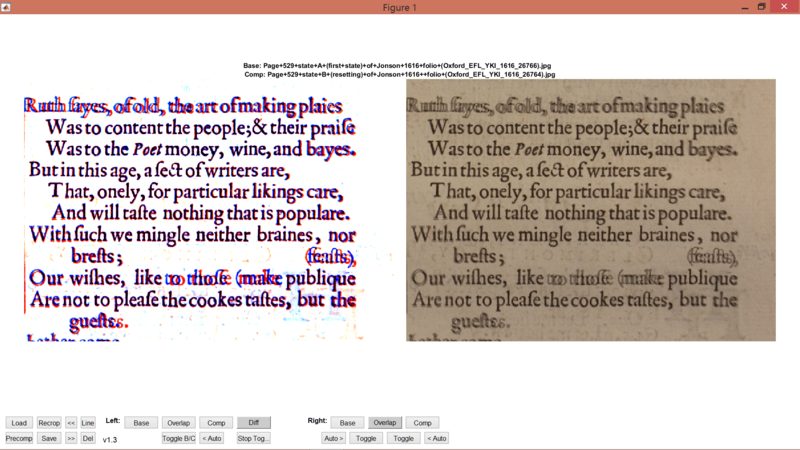 We also have a longer-term plan to improve Optical Character Recognition for early modern print, so that we can integrate an OCR function into the collator. This will additionally allow comparison of extended passages, or editions, which have been reset; it will work directly from the same images as the image comparator, and will allow seamless movement between the two methods of comparison. We have recently begun work on this aspect of the project. The software and subsequent updates are available for free download via a dedicated website. For system requirements, user instructions, and to download, please click here. The associated image capture equipment is available to order: for a full description, specifications, pricing, and order information, please click here. The development of the collation project is supported by the Balliol Interdisciplinary Institute, the Lynne Grundy Memorial Trust, and EPSRC Programme Grant Seebibyte.